Sunday January 26th 1902 It was intensely cold today but we went out to Aunt Emmas in the bobsled for Mollie. We had a nice visit and enjoyed Aunt Emmas good dinner. We all read in the evening. Monday January 27th 1902 It was a very cold day. I was busy in the kitchen all day. I fried down five small jars of sausage. It takes more time for the meals when it is so cold. Tuesday January 28th 1902 Still very cold. I did baking, fried doughnuts, and made mince meat today. In fact worked in the kitchen all day. 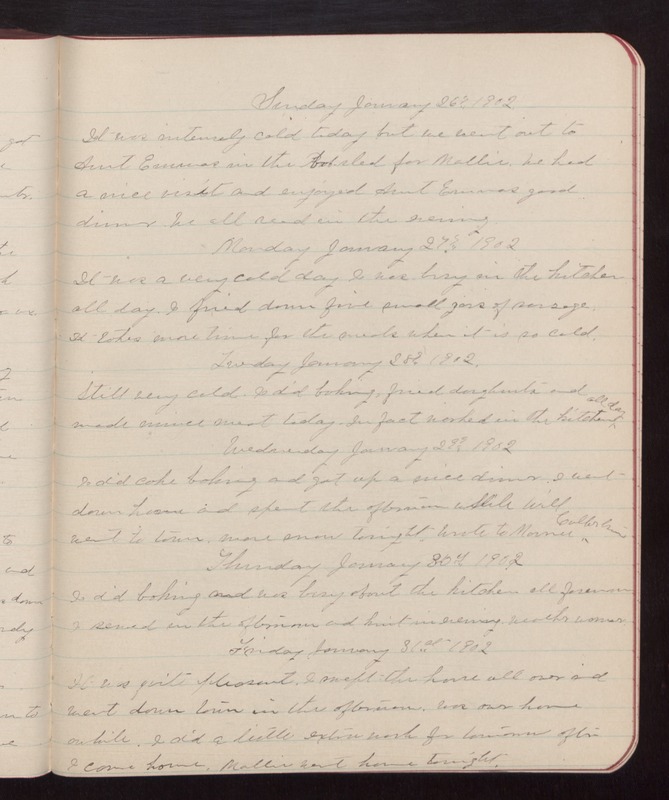 Wednesday January 29th 1902 I did cake baking and got up a nice dinner. I went down home and spent the afternoon while Will went to town. More snow tonight. Wrote to Marnie Culbertson. Thursday January 30th 1902 I did baking and was busy about the kitchen all forenoon. I sewed in the afternoon and knit in evening. weather warmer. Friday January 31st 1902 It was quite pleasant. I swept the house all over and went down town in the afternoon. Was over home awhile. I did a little extra work for tomorrow after I came home. Mollie went home tonight.